Did you know that April is National Grilled Cheese month? I found out while shopping at the grocery store. I saw some recipes and signs for grilled cheese sandwiches near the cheese section. My grocery store has an amazing specialty cheese section so I love buying nice cheeses. And my kids love all the samples-however, they don't like aged cheddar or "stinky cheese" as Parker calls it. 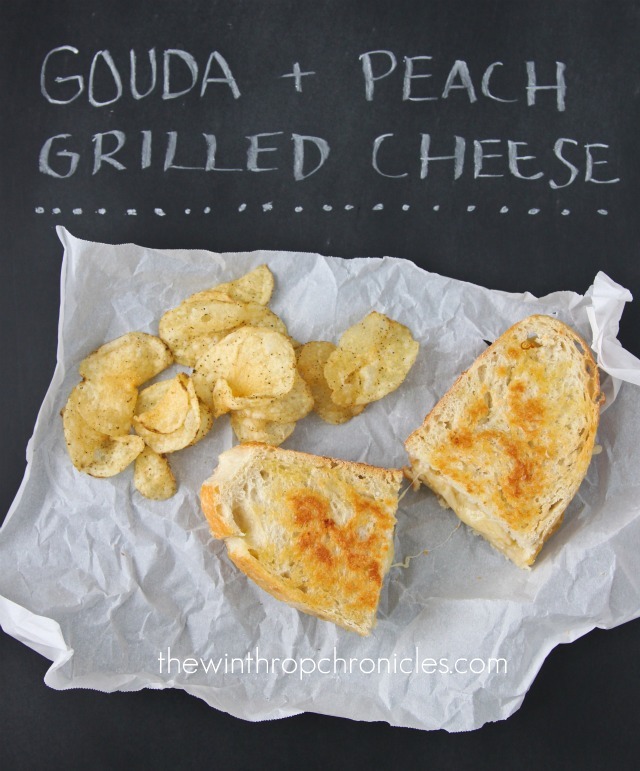 I grabbed a few cheeses and some recipes and we had ourselves some grilled cheese sandwiches. (We paired the sandwiches with some of our favorite natural sea salt and pepper chips and one of our favorite root beers). 1. In a small bowl mix cayenne pepper and peach preserves. 2. Heat a skillet or panini maker. 3. Spread the peach preserve mixture on both insides of the bread slices, sprinkle the gouda on to the bread and then top with other slice of bread. Drizzle olive oil and sea salt on the side of the bread that will be touching the skillet.